San Diego is a bright and colorful city made even more beautiful by the rich diverse cultural heritage and traditions of the residents living in America’s Finest City. From Little Italy and Old Town to San Diego’s historic Chinatown (which arose in the 1860’s), festivals, parades and ceremonies are a frequent occurrence, and so are culturally traditional weddings-which can almost seem like their own festivals and are an impressive sight. While some traditions, specifically in the Chinese culture, have been retired as archaic, many of the steadfast traditions (or ‘courtesies’ in Japanese weddings) are still honored. Traditionally in the past Chinese engagements were arranged by the parents of the betrothed or even professional matchmakers were employed to ensure a wise decision for the union of families. This practice is no longer popular, but the basic traditions of a Chinese engagement and wedding are still practiced. The first of the “six courtesies” or traditional processes are the marriage proposal itself, which does include the diamond ring and sometimes betrothal gifts to the parents of the bride to be. Most often though the gift giving gets going once the bride accepts the proposal, then the second courtesy applies. The second courtesy is still customary where the groom’s family gives a gift(s) to the bride’s family which can even be baked goods. The catch is, once those gifts are accepted the proposal is not to be called off (without extreme opposition and difficulty). Most cultures practice superstitious traditions as key elements of a wedding ceremony and it is not uncommon for the 3rd and somewhat final seal of approval for the wedding to come from a fortune teller. This is of course not based on just superstition but a deep cultural significance placed on the Chinese calendar and the belief in signs of compatibility. The significance of dates even plays a major role in the date that is chosen for the wedding ceremony itself, a Chinese almanac is relied upon for guidance in setting the date. 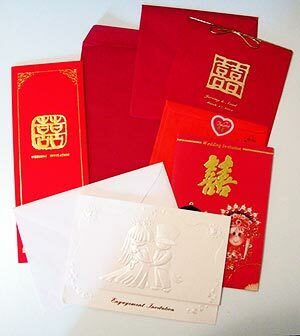 The six courtesies of a traditional Chinese weddings are; the proposal, consulting about the union or “asking for names” (derived from the importance of surnames for paternal lineage), prayer, gift giving, invitations sent, and finally-officially welcoming the new bride. Recently there has been a growing popularity in practicing what are considered Confucian wedding rituals, which include bowing to a Confucius portrait (icon), includes more traditional wedding dress attire (the bride wears a red wedding dress) and there is a bowing ritual before the couple proceeds into the “nuptrawewqeial chambers”. The first bow is for Heaven and Earth, the second bow is to honor ancestors, the third is in honor of the newlyweds parents, and the fourth and final bow is to each other, the new spouse. Regardless of cultural heritage weddings can become spending extravaganzas, and Chinese weddings are no different. In China the cost of a wedding can sometimes make our western “Bridezillas” look tame, but weddings are serious business there with an estimated 10 million ceremonies every year! Location is always an important consideration for not just the happy couple to be, but for guests to enjoy and also the photographic value. It’s not just the diamond ring that western culture has shared with Chinese, the rising popularity of elaborate photo montages, collections and movies have become epics in professional presentation. Living in San Diego or even traveling to San Diego for the wedding provides no shortage of gorgeous backdrops, most of which include our beach, ocean and skyline-all natural beauties that are free in San Diego. Taking your friends and family aboard a yacht in San Diego Bay for your wedding ceremony, reception, or even engagement celebration is an perfect way to not only get all the best photo opportunities that San Diego has to offer, but is a gift for everyone aboard. Creating traditions are part of the family circle and by having your wedding on a yacht in the bay, you can look forward to many romantic anniversary cruises, creating a tradition for your family as the circle gets bigger. The Chinese Wedding Décor page on Pinterest has an expansive and beautiful collection of some visual inspiration for decorations, favors, food and much more for an unforgettable traditional Chinese wedding!